A R Akin Rare Coins & Currency address, phone, website, hours of operation, and more. 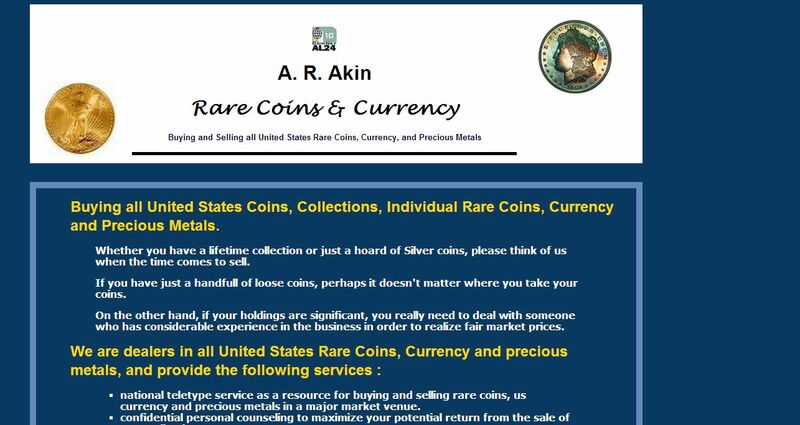 With over thirty years of business experience, we are positioned within the industry to provide a wide variety of service to the numismatic community. Our standards for excellence and industry reputation make us uniquely qualified to address your needs, whether buying or selling. We have been collectors and know the time and care that often goes into the formation of a cherished collection. When buying collections, careful attention is given to each item, and we strive to pay a fair price consistent with current maket values and demand from collectors. Our business is conducted by the golden rule: you will be given the same consideration that we would hope to receive if we were in a similar position. If, for any reason, we are unable to offer you a fair price for your holdings, we will be pleased to refer you to someone who can.